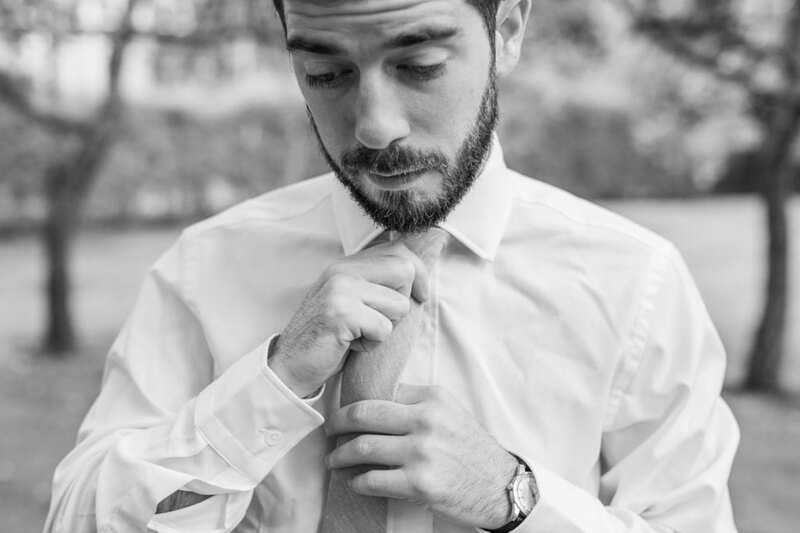 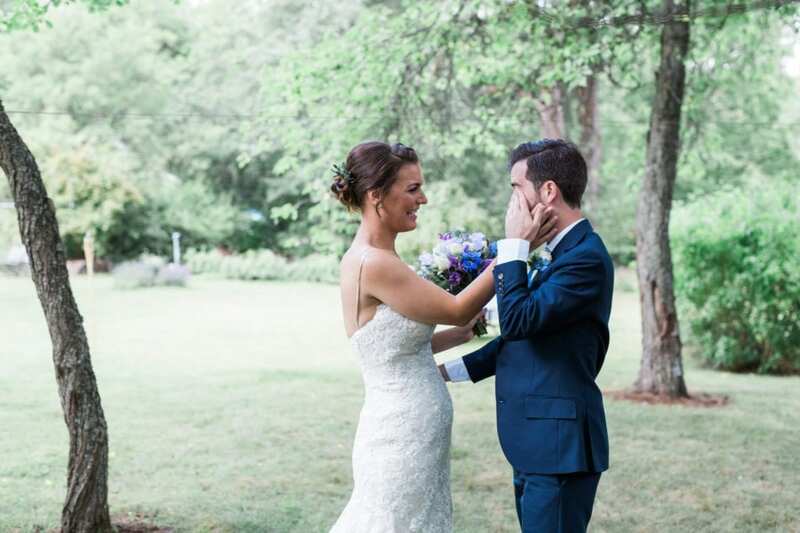 “We met while working together at a television network in London. 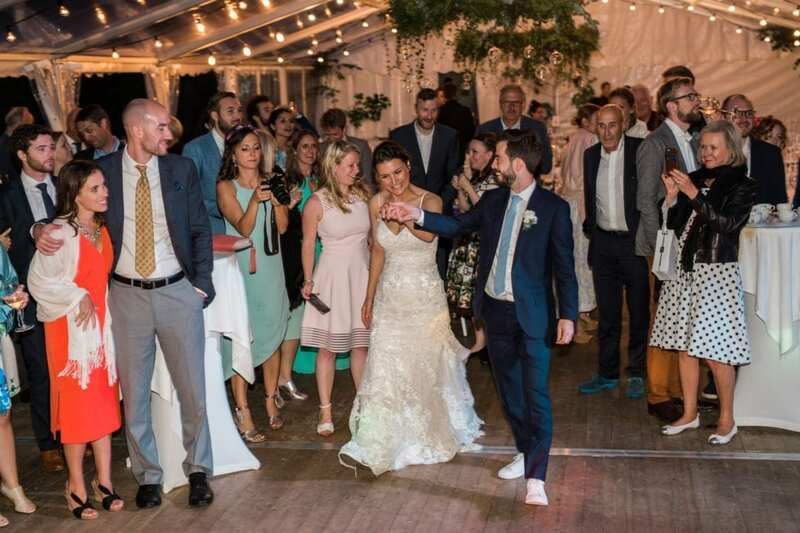 Even though we tried to keep our relationship a secret, it was obvious to all of our colleagues that we were crazy about each other! 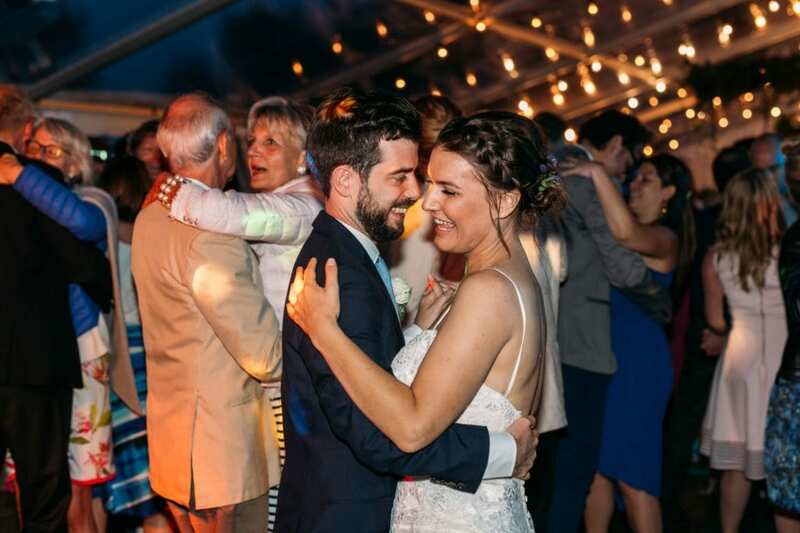 Five years later, Dan took Alexia for a long (very long – about six hours!) 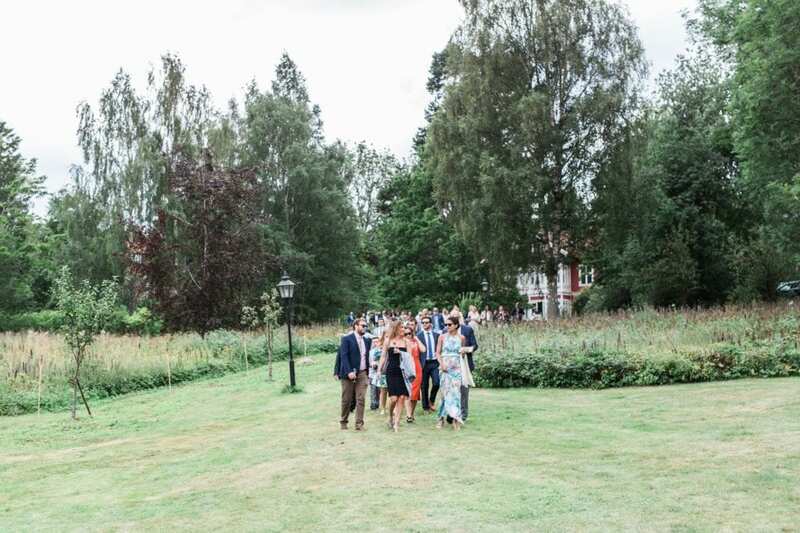 walk around London’s beautiful Hampstead Heath and popped the question, and of course she said yes. 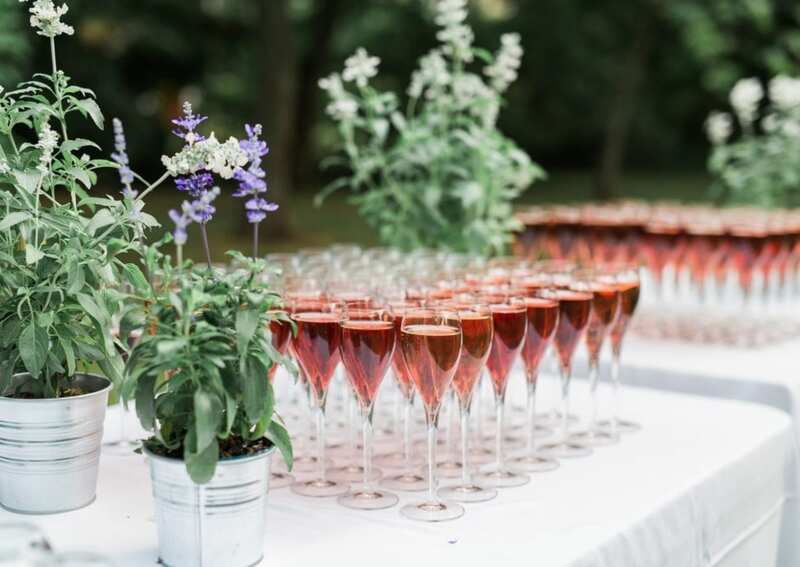 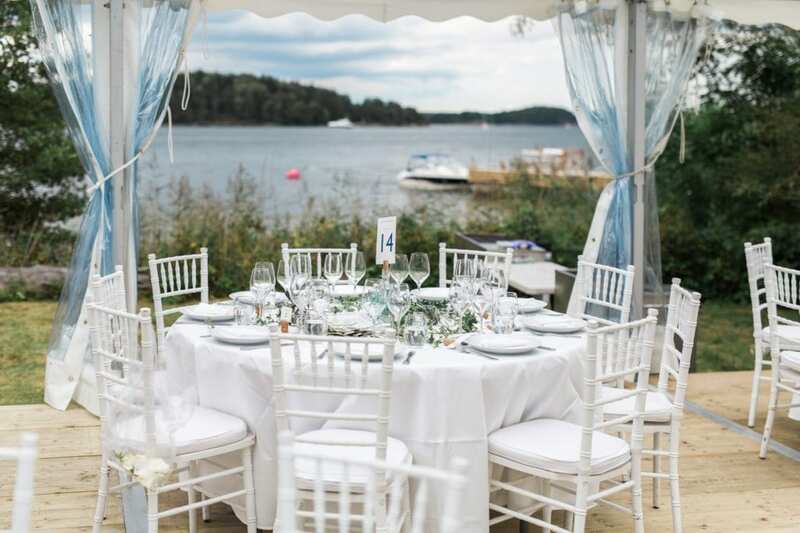 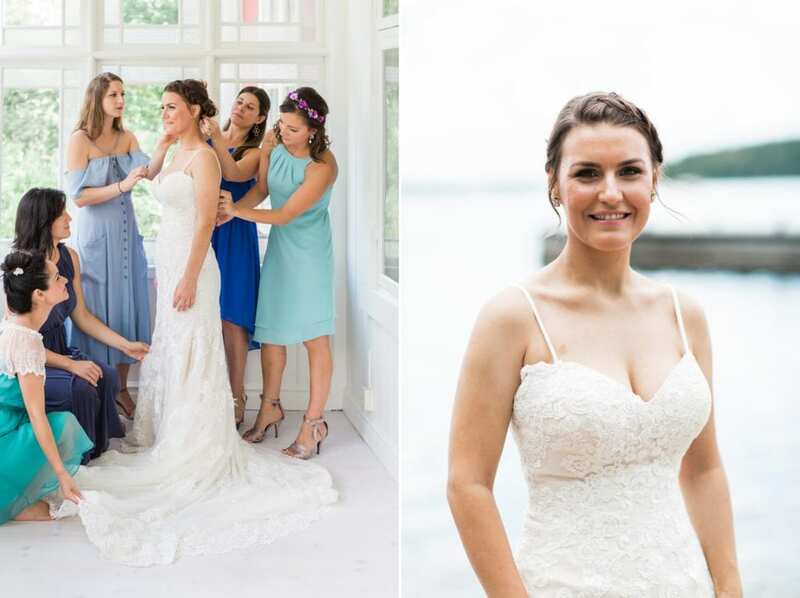 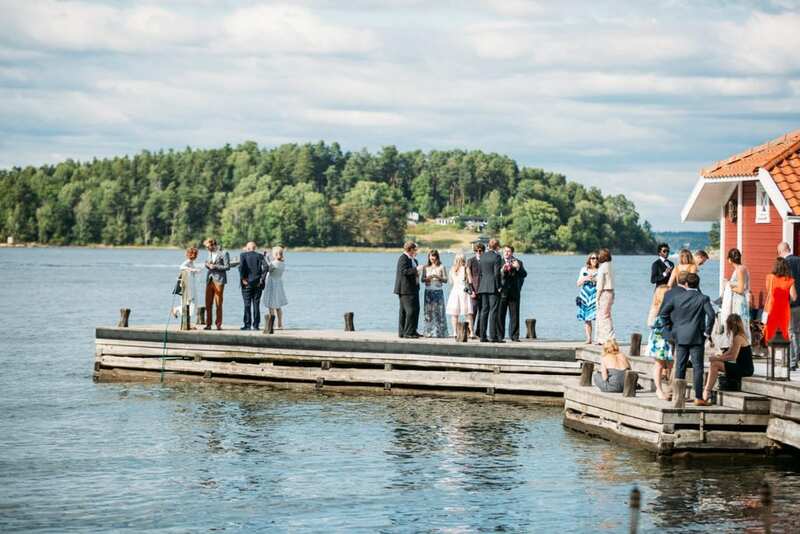 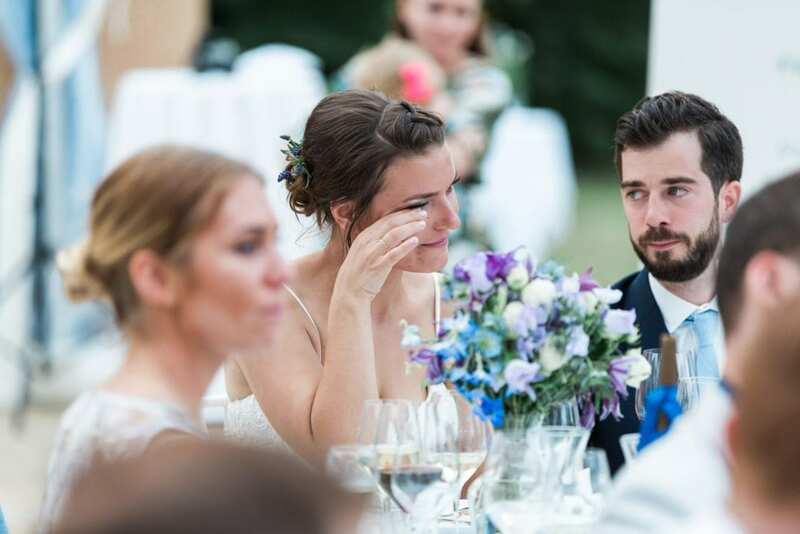 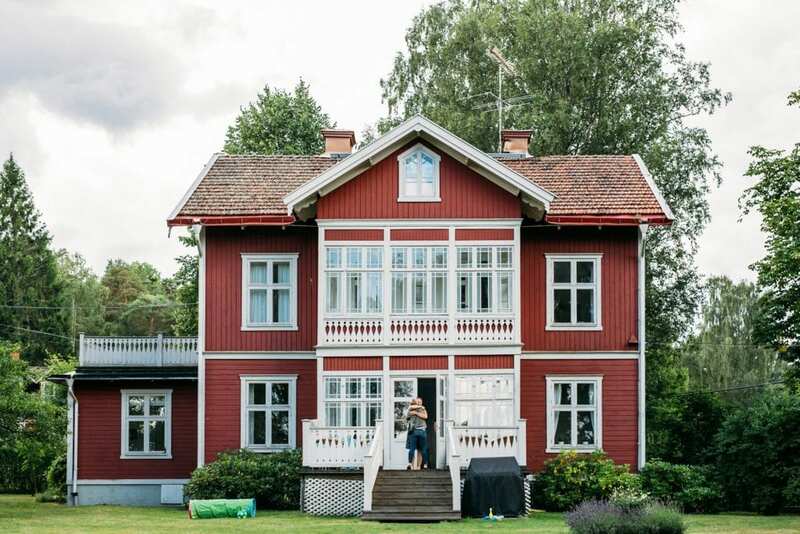 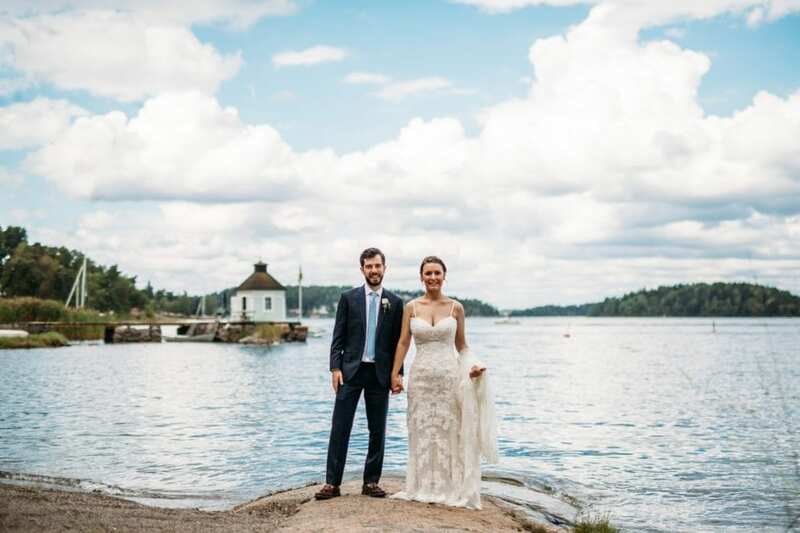 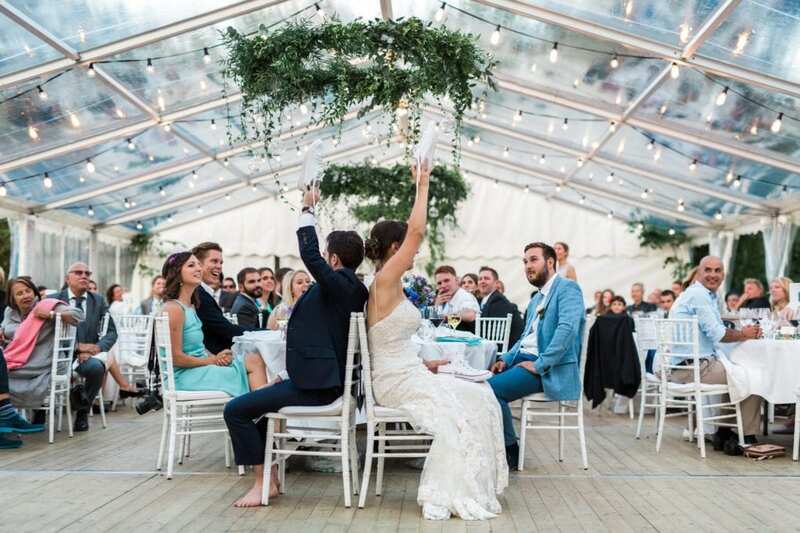 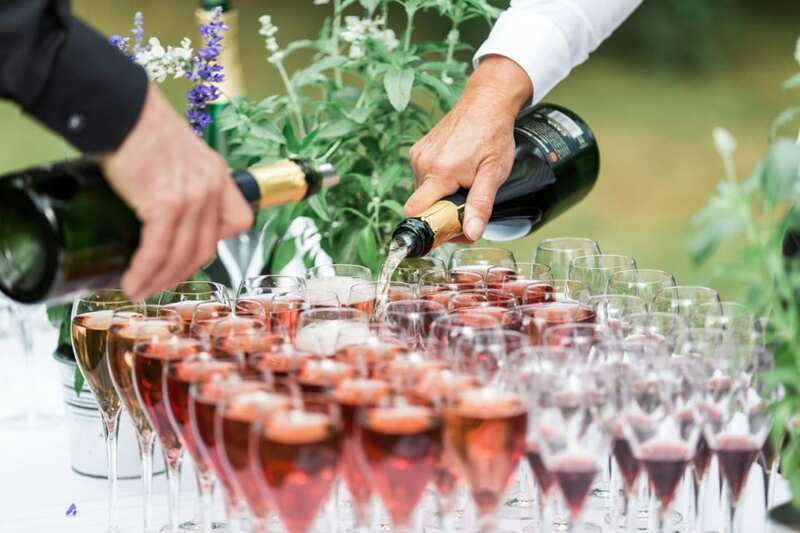 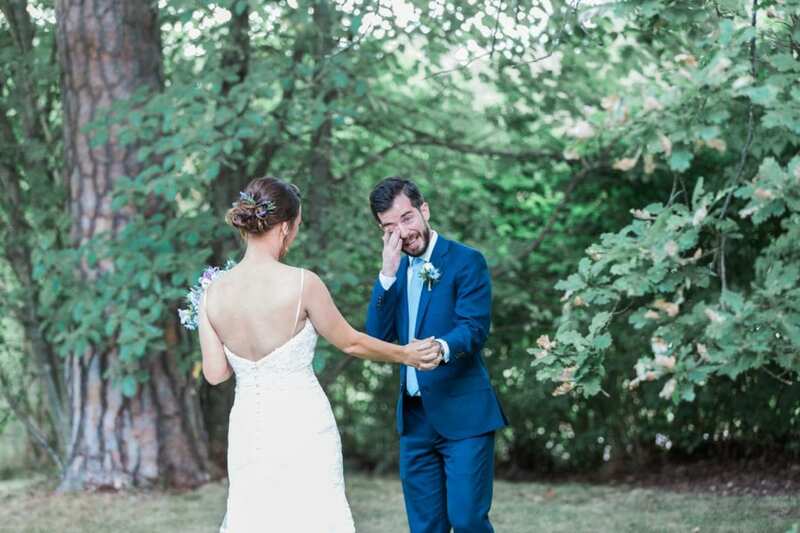 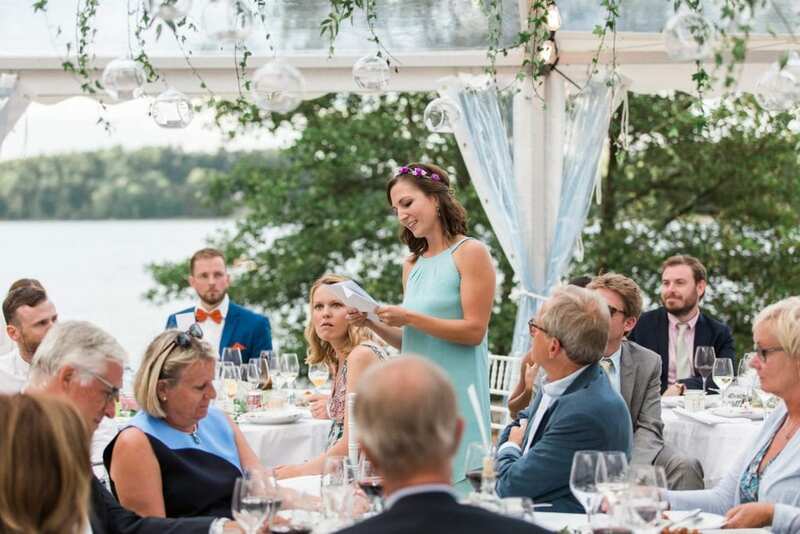 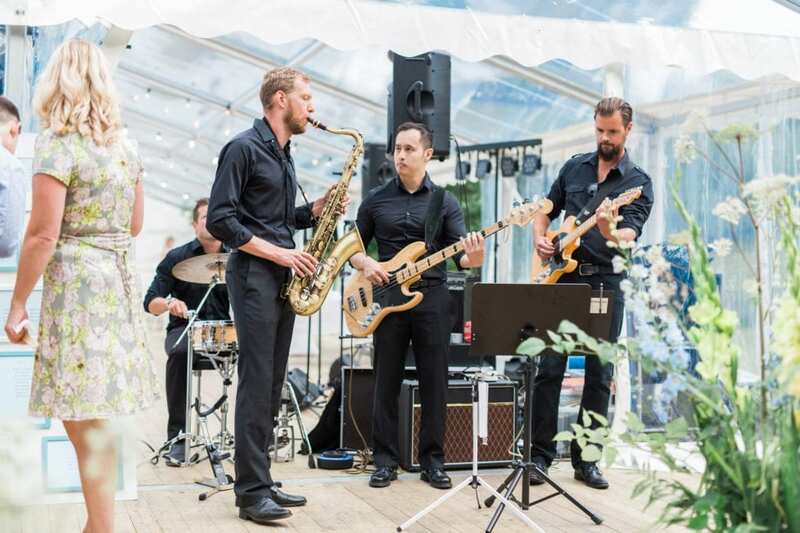 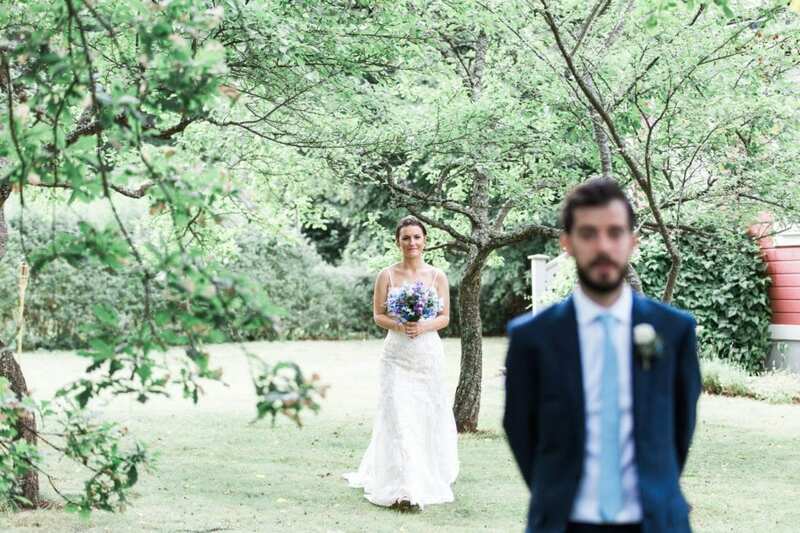 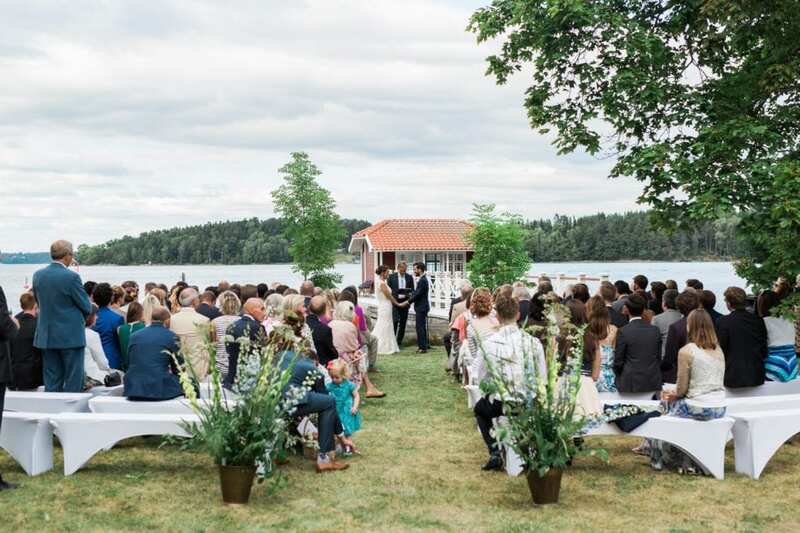 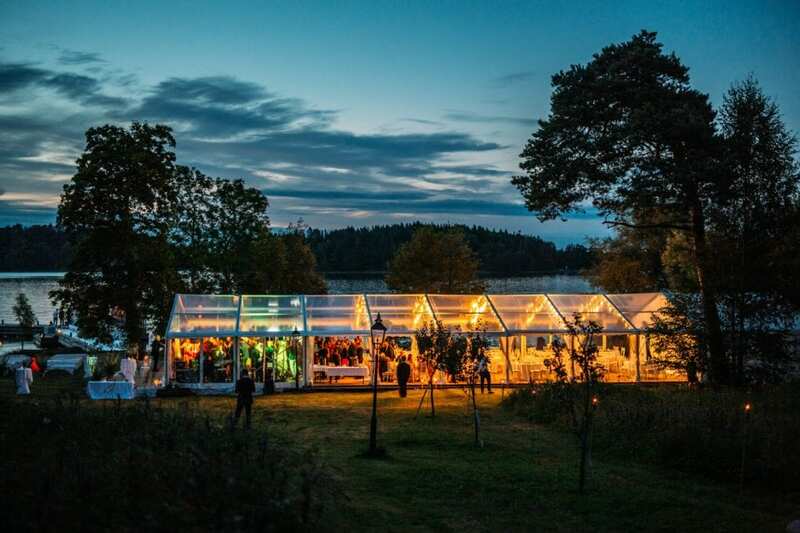 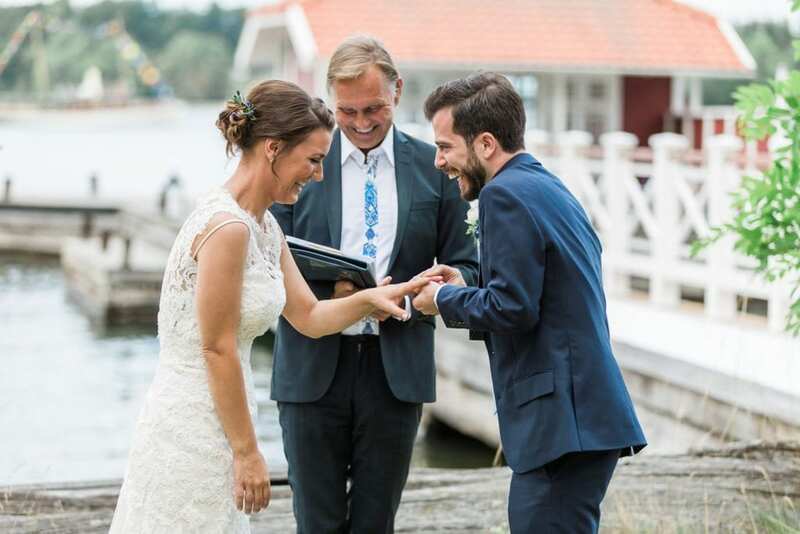 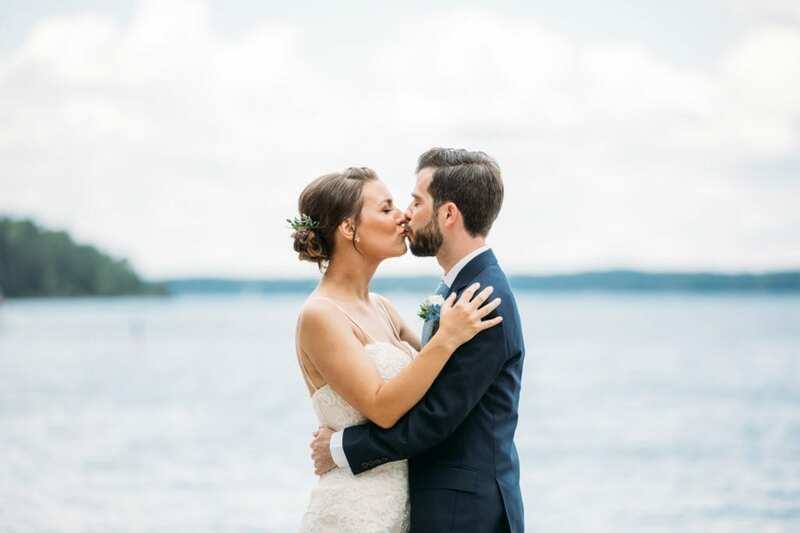 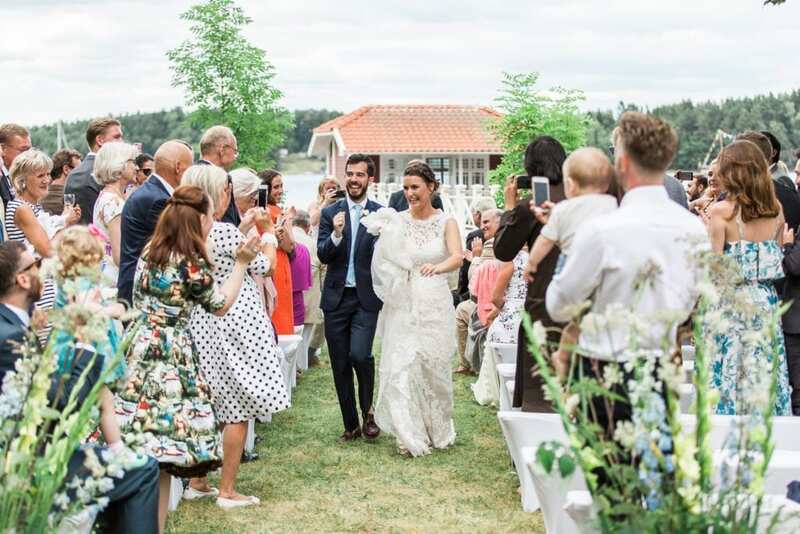 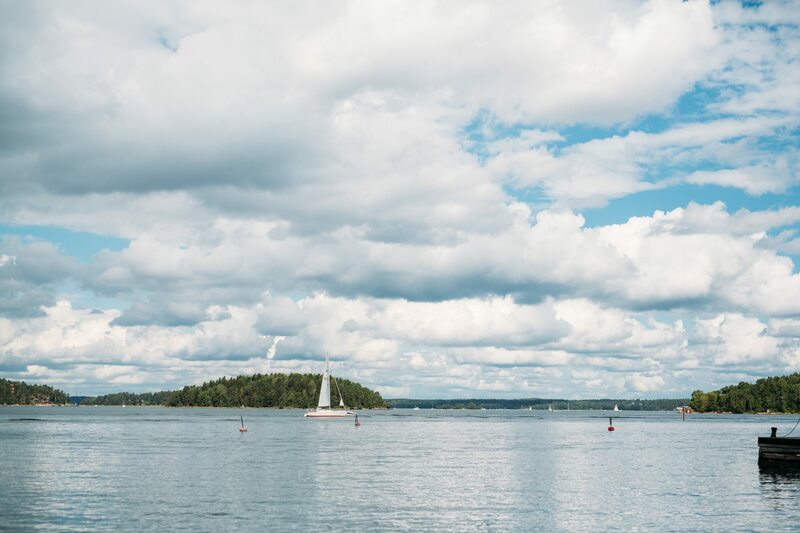 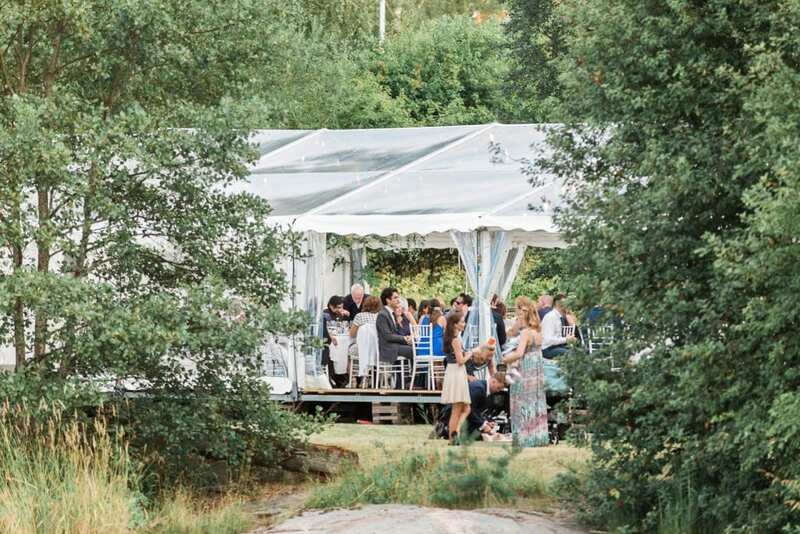 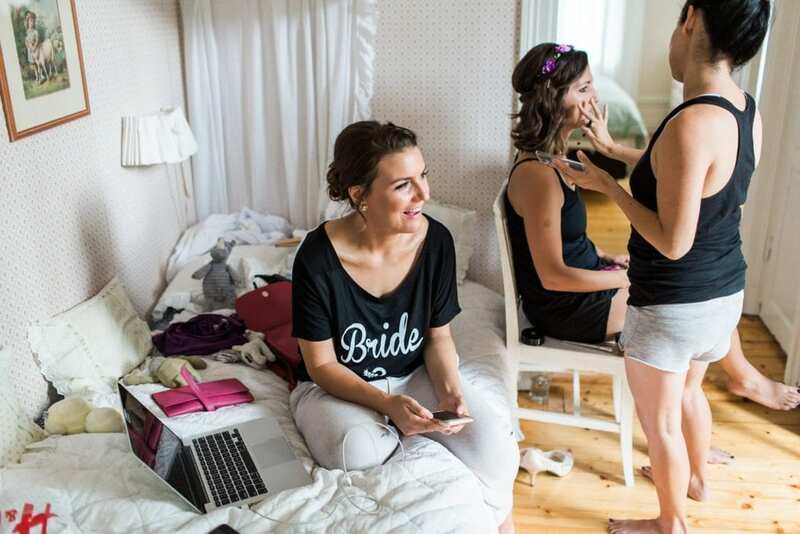 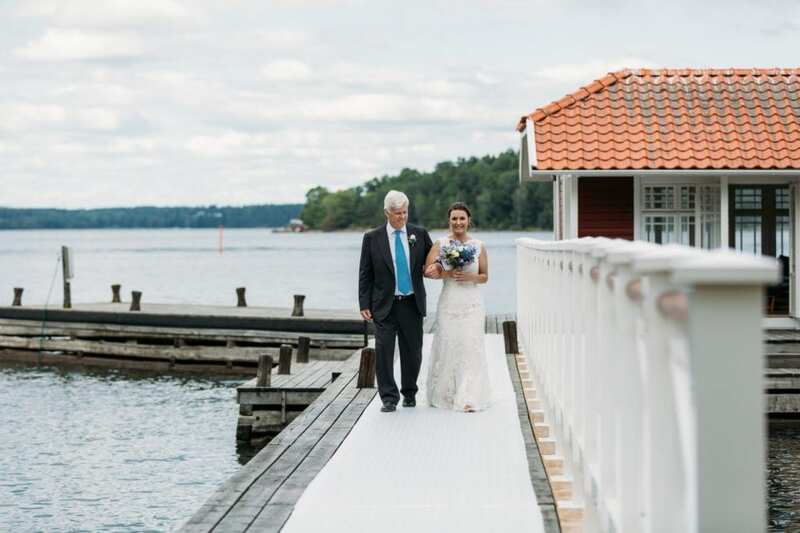 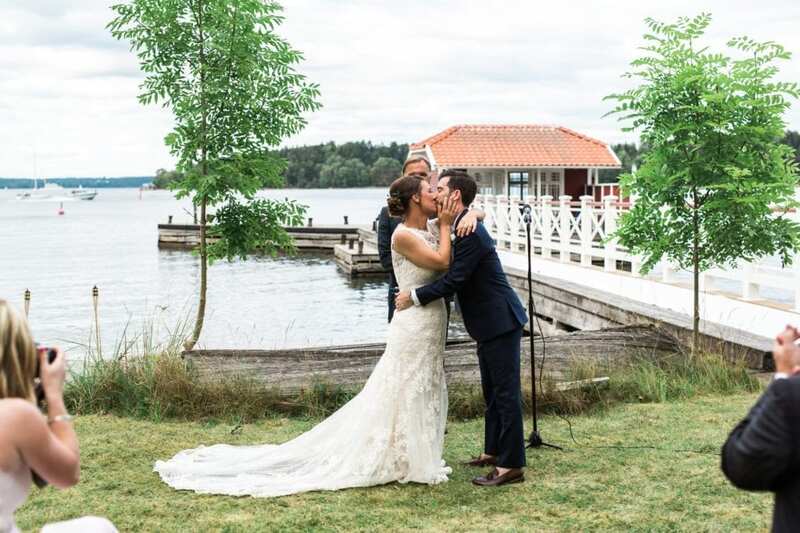 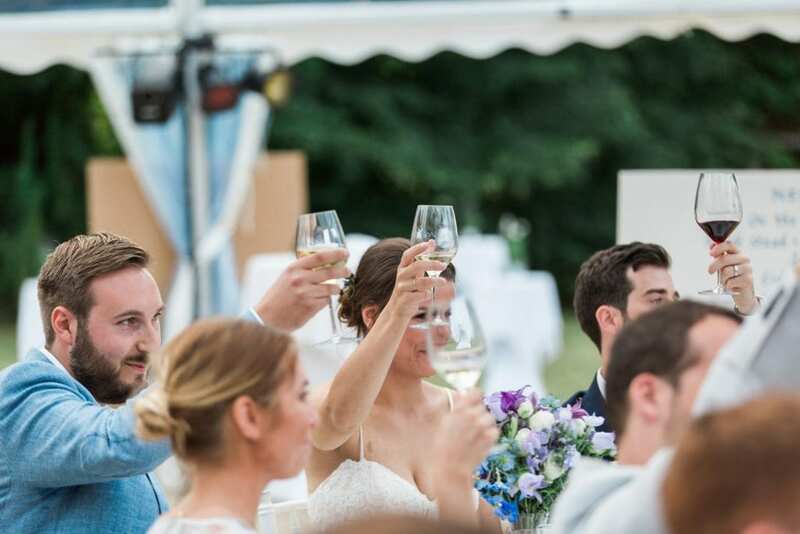 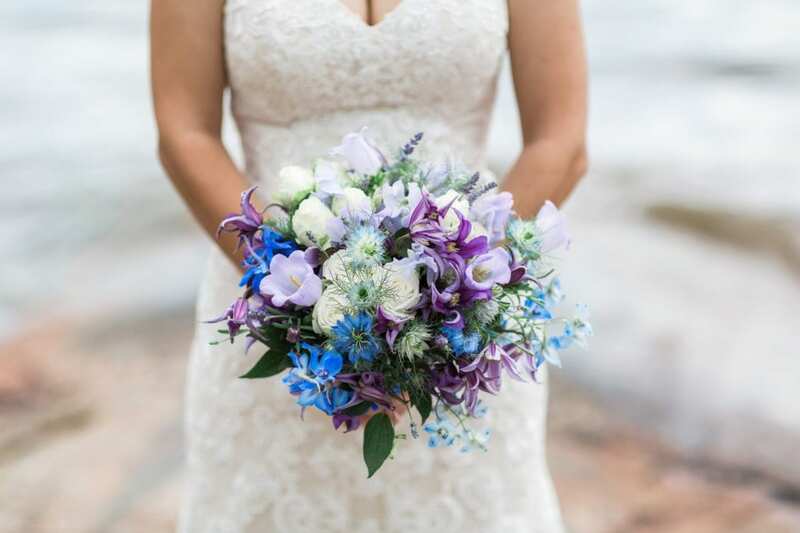 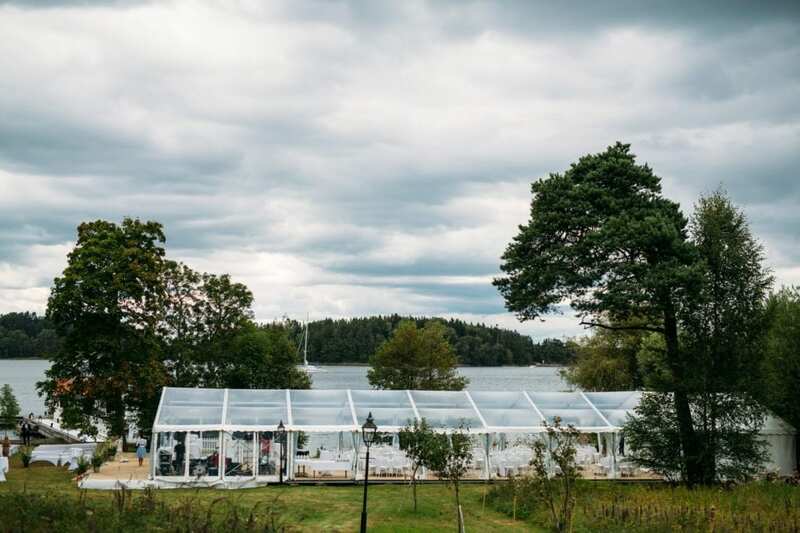 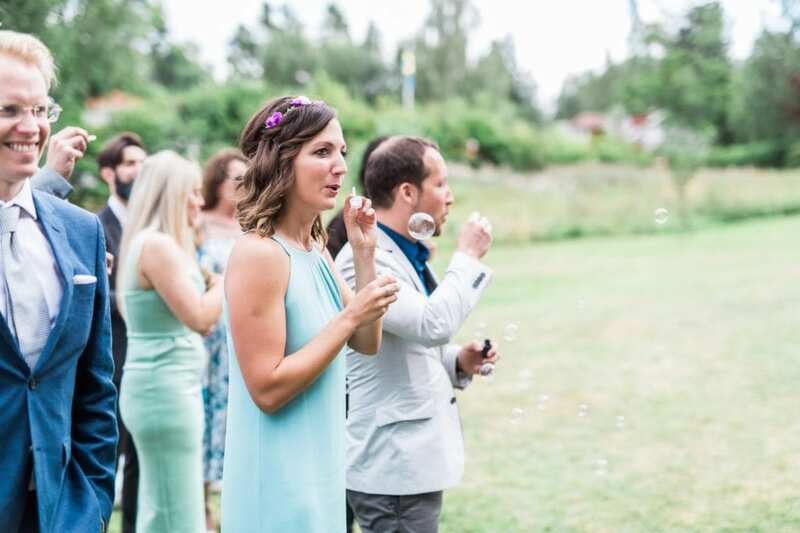 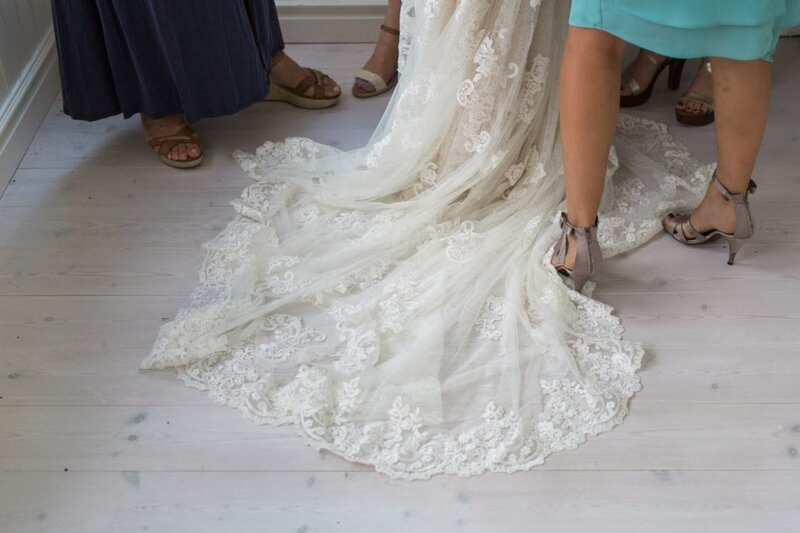 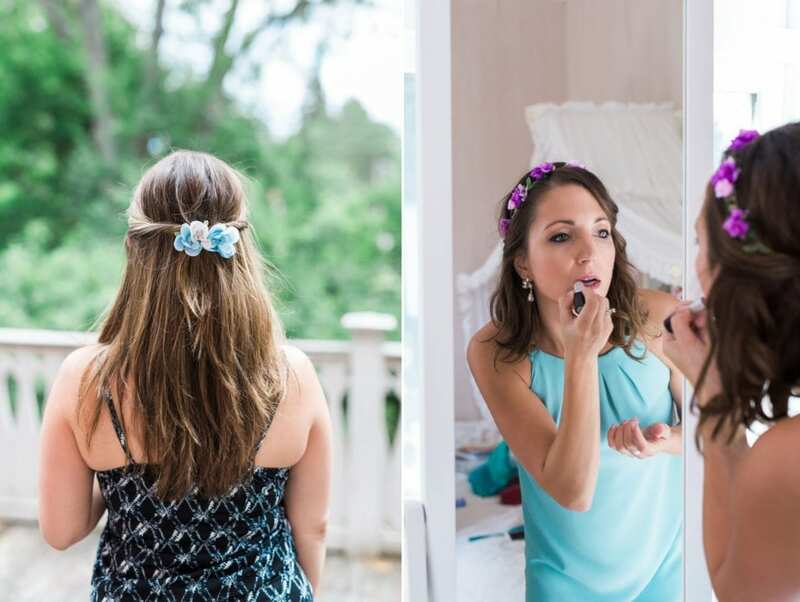 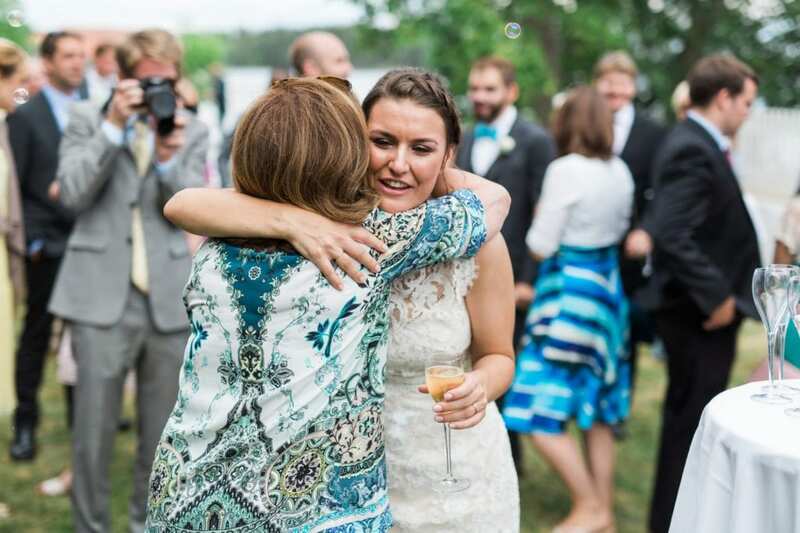 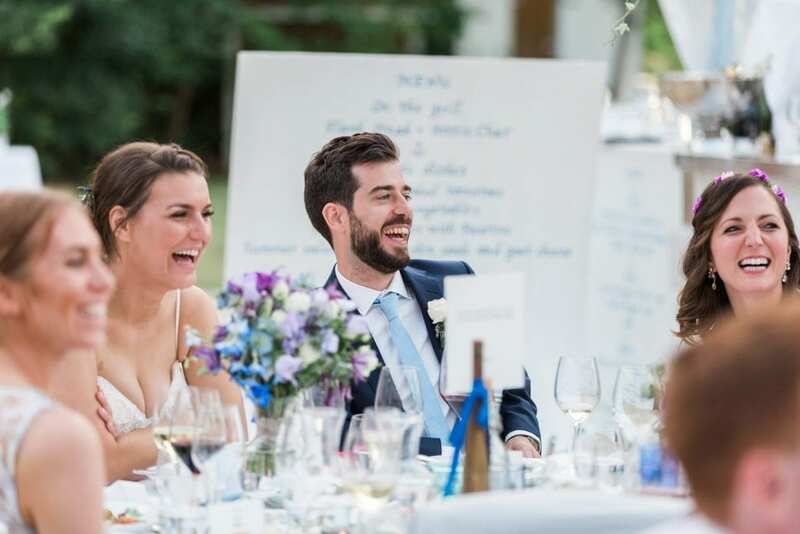 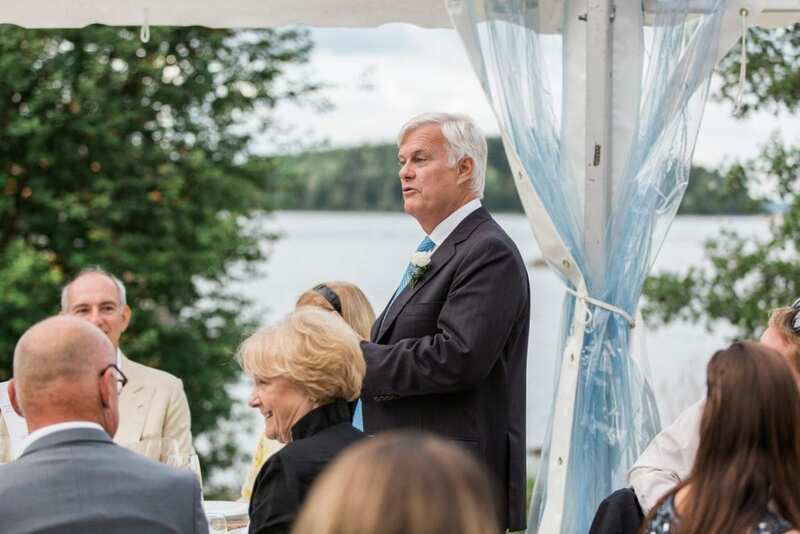 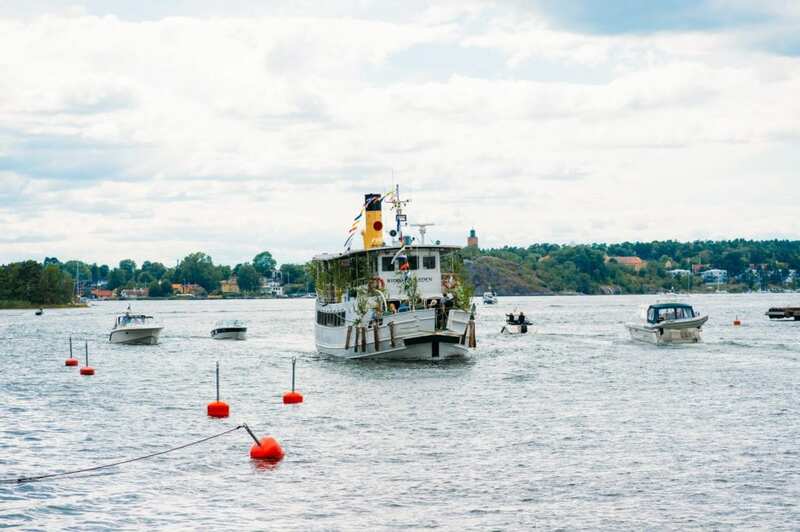 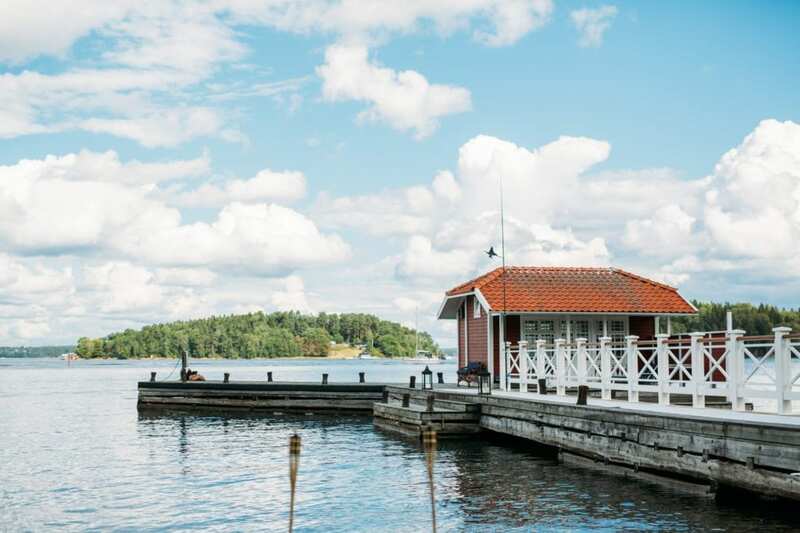 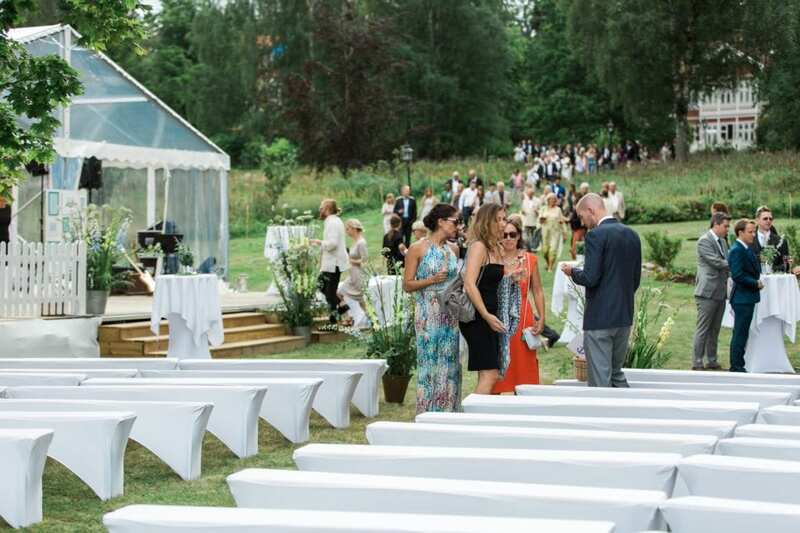 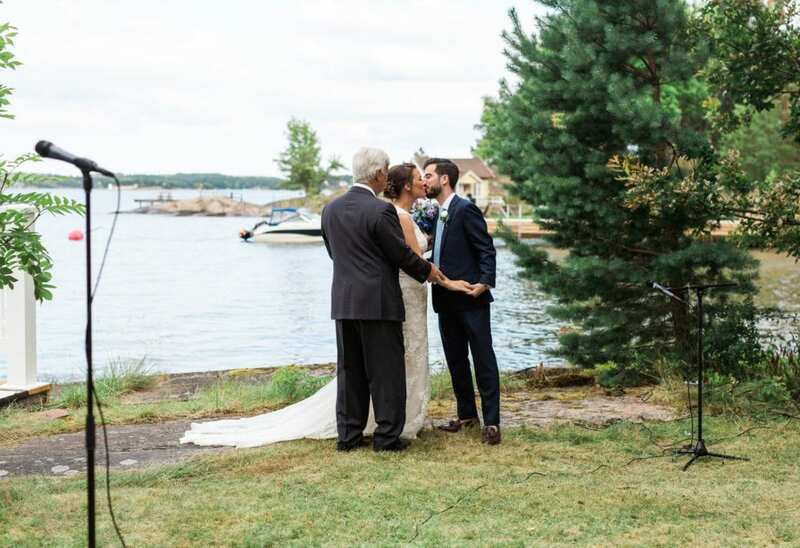 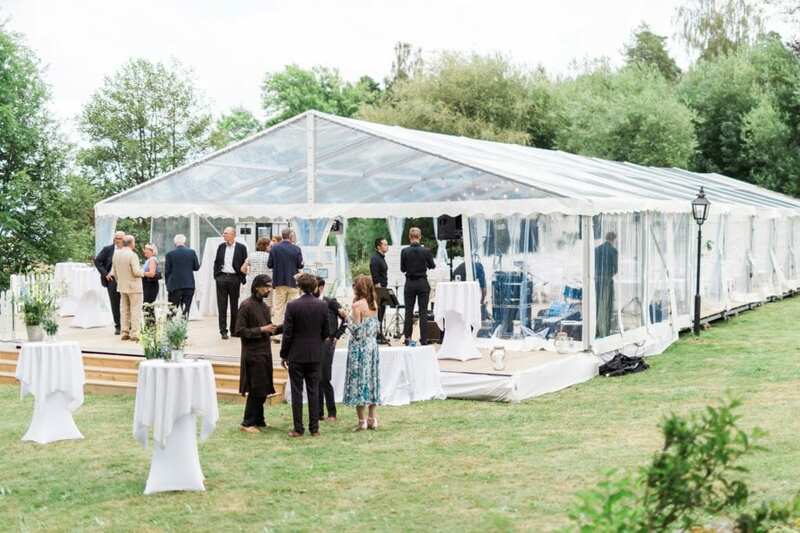 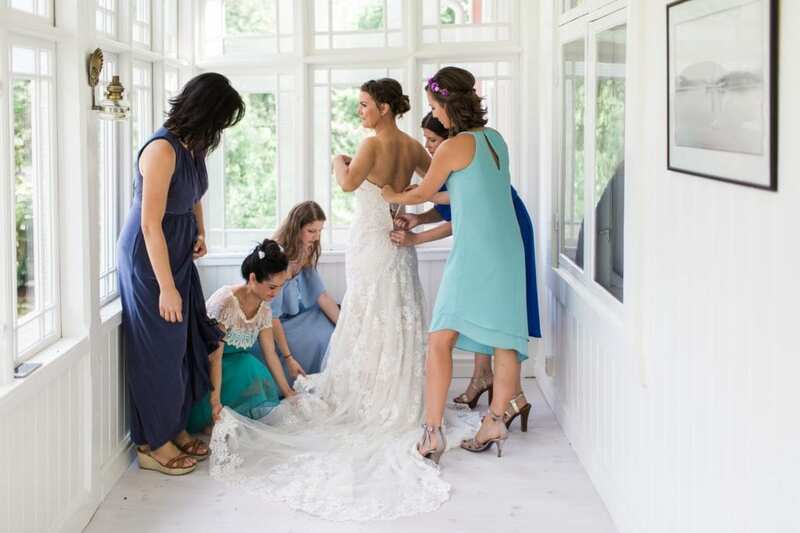 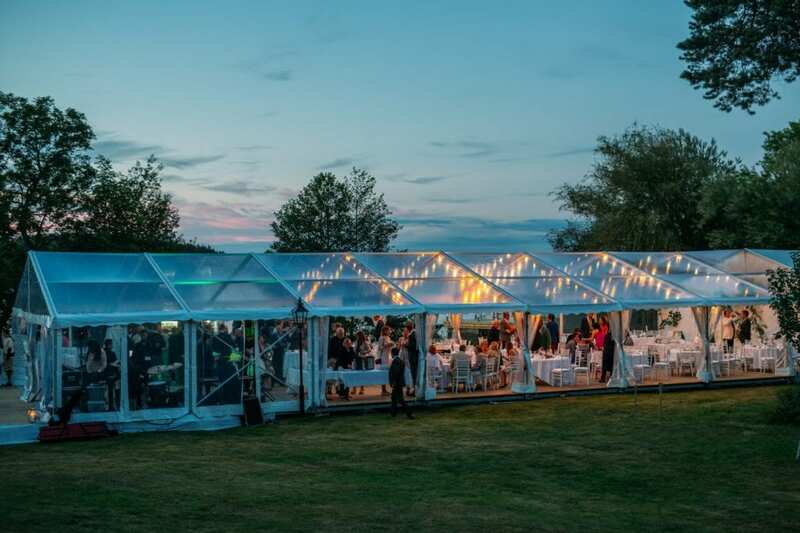 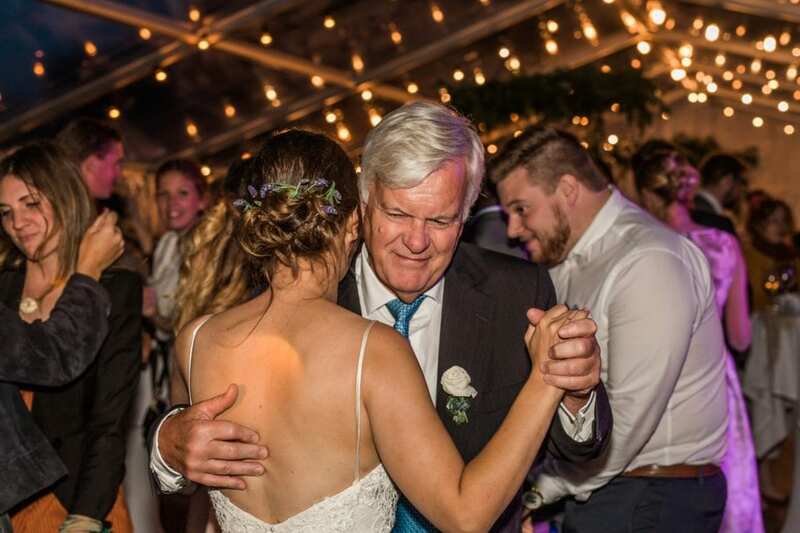 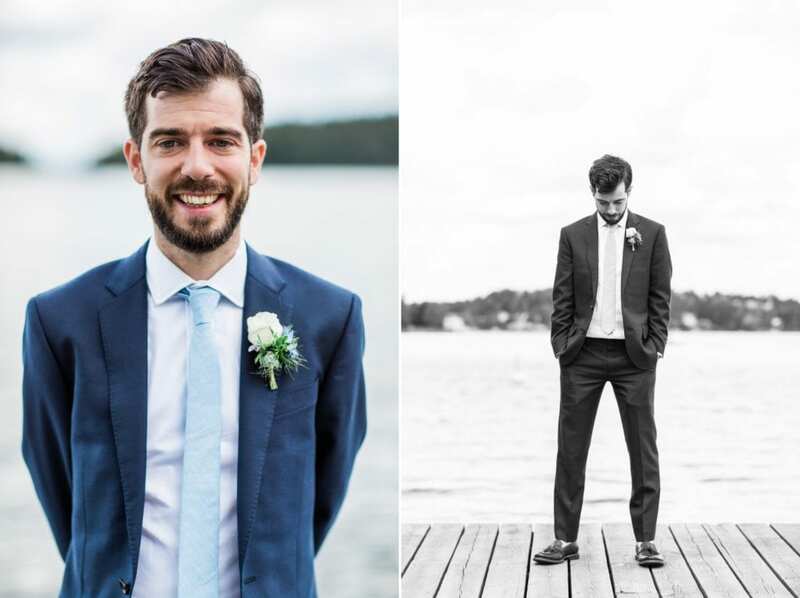 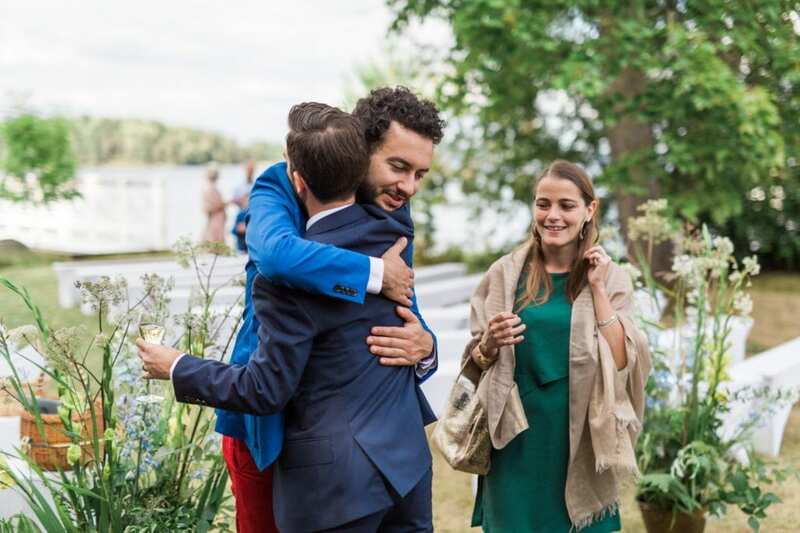 When planning our wedding, we knew immediately that we wanted it to be in Stockholm’s archipelago – where the bride has spent every summer since she was born and a place that Dan has come to love as much as his native Norfolk, England. 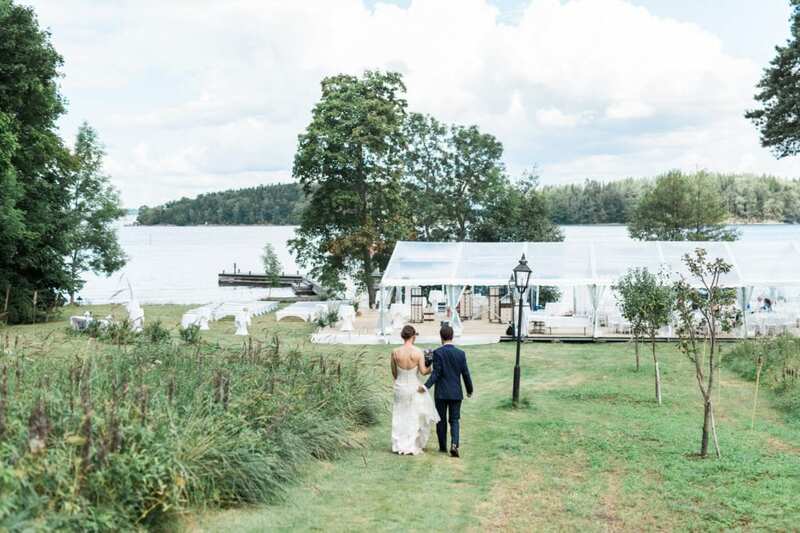 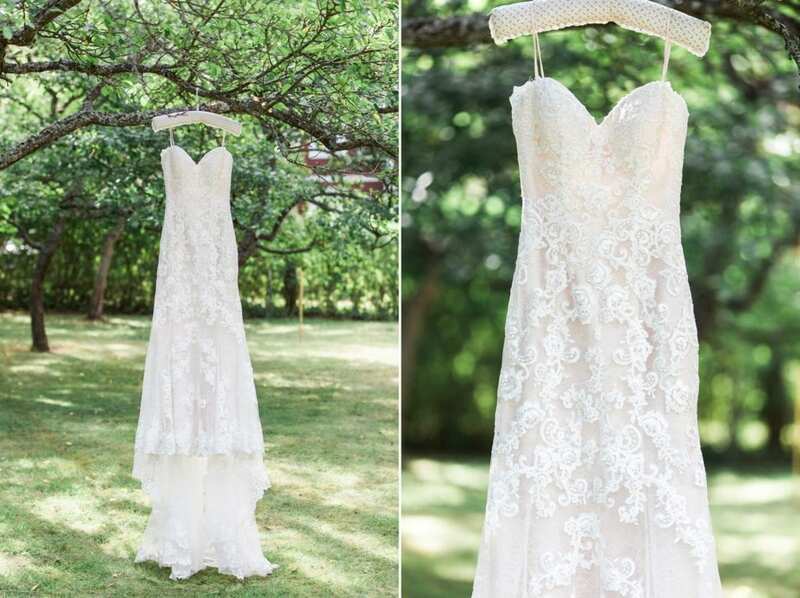 With such a naturally beautiful setting, it really made choosing all the additional elements easy! 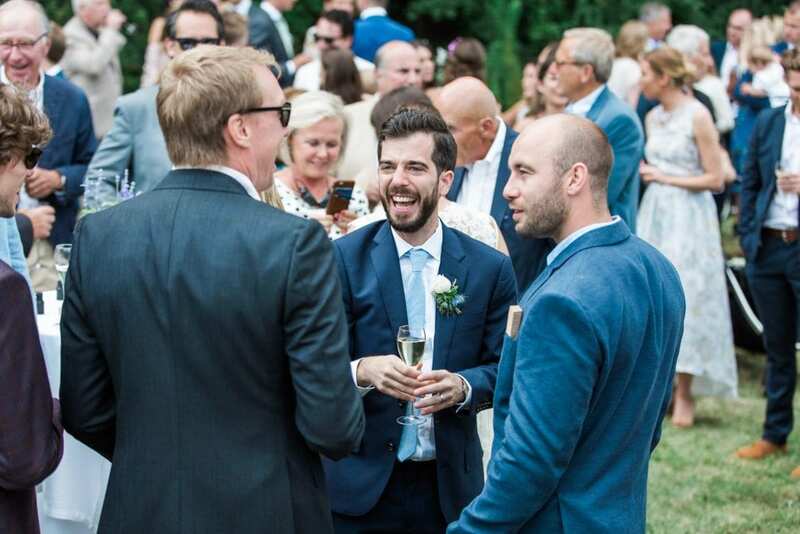 Many of our guests travelled from far away (from Singapore to South Africa to San Francisco!) 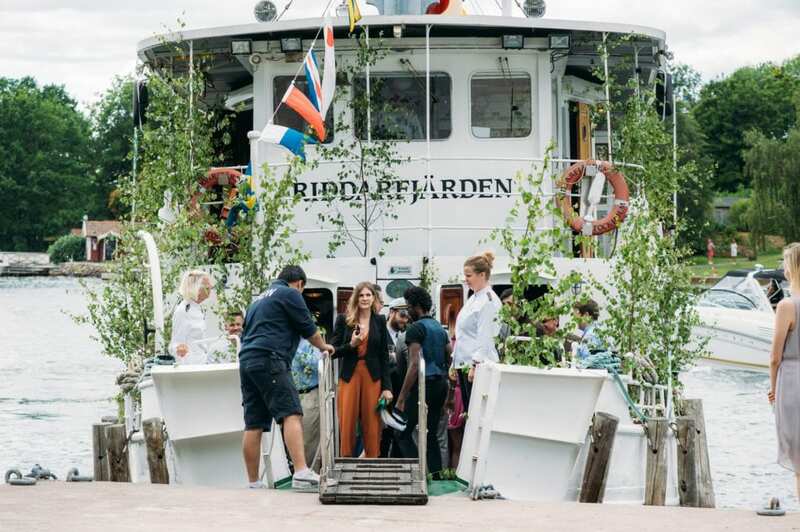 and we really wanted our guests to experience the amazing and totally unique beauty that is Swedish summer in the archipelago. 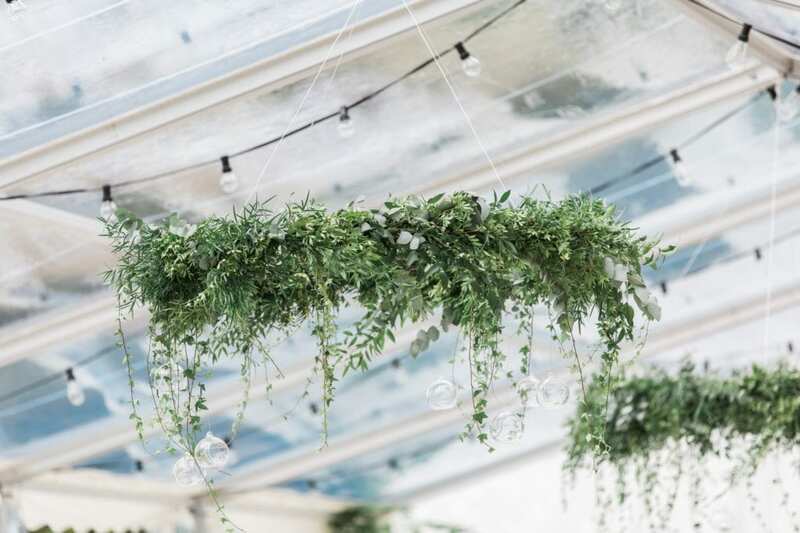 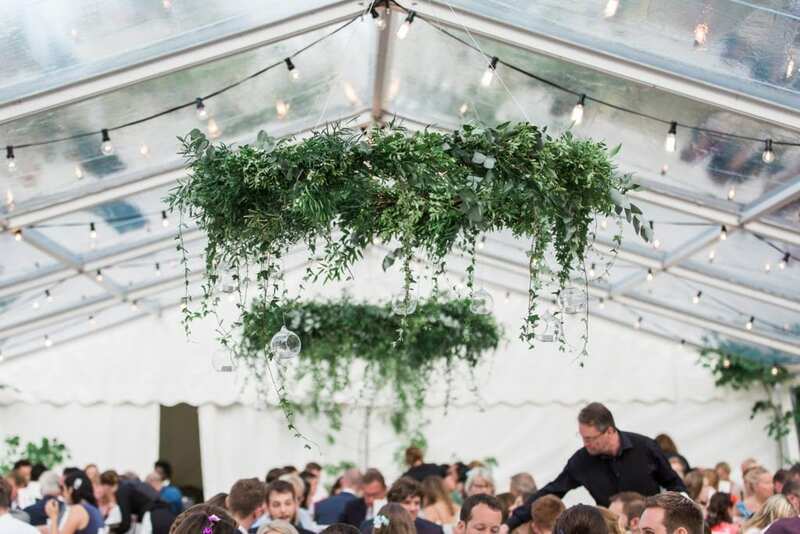 So we really just focused on using clean and simple colours (white and different shades of blue) and lots of natural elements, like the green wreaths in the clear roof tent, and our tables were covered with ivy, olive branches, lavender and rose petals. 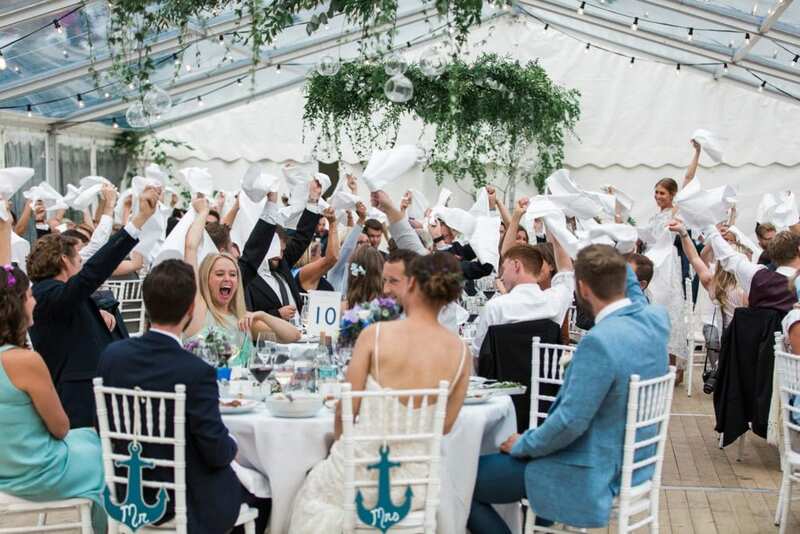 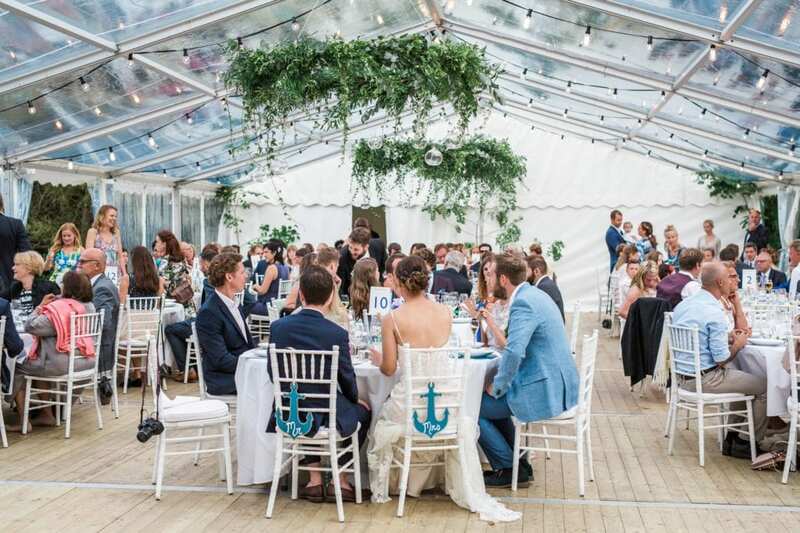 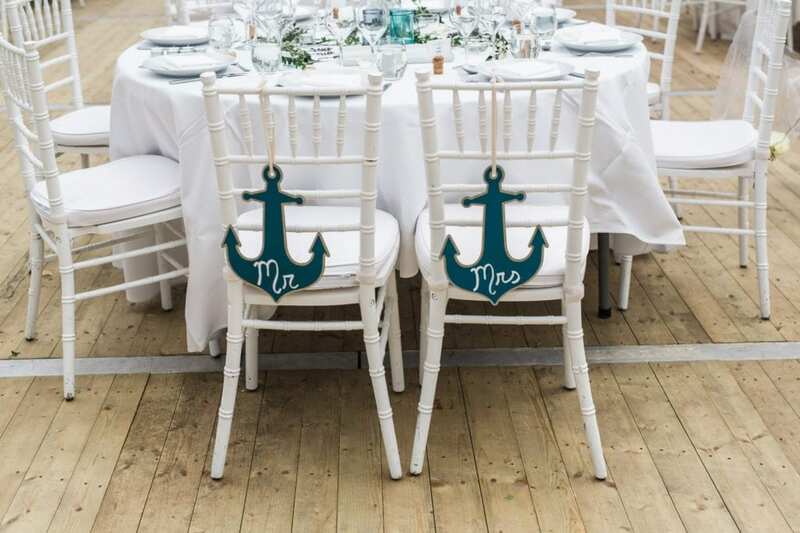 We also embraced the nautical theme, as guests arrived from Stockholm to the wedding on an old Vaxholms boat and we included an anchor and a fisherman’s knot on all our invites, table seating and place cards. 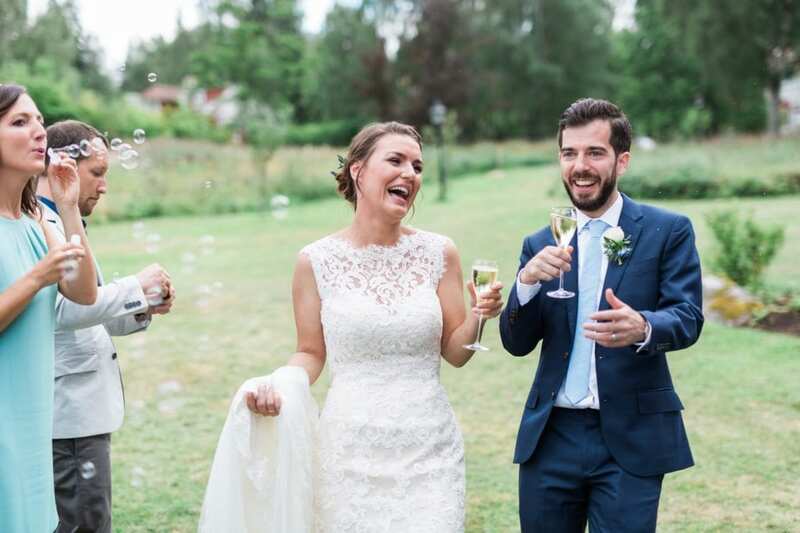 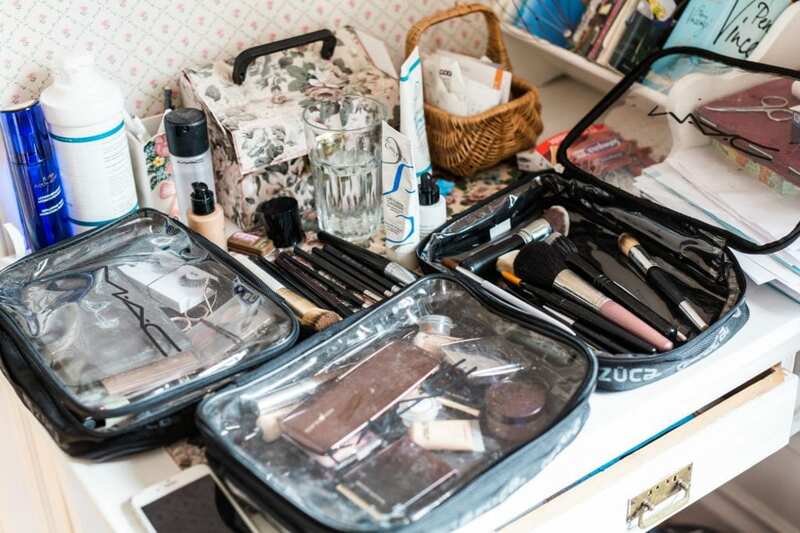 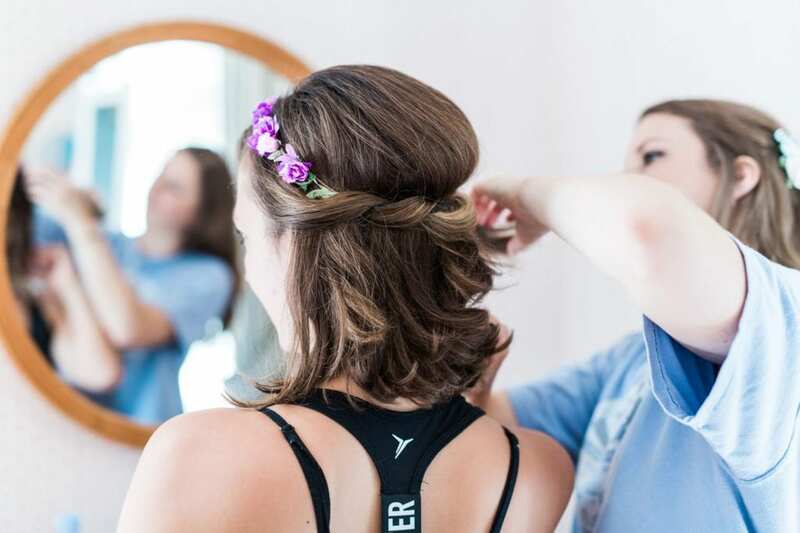 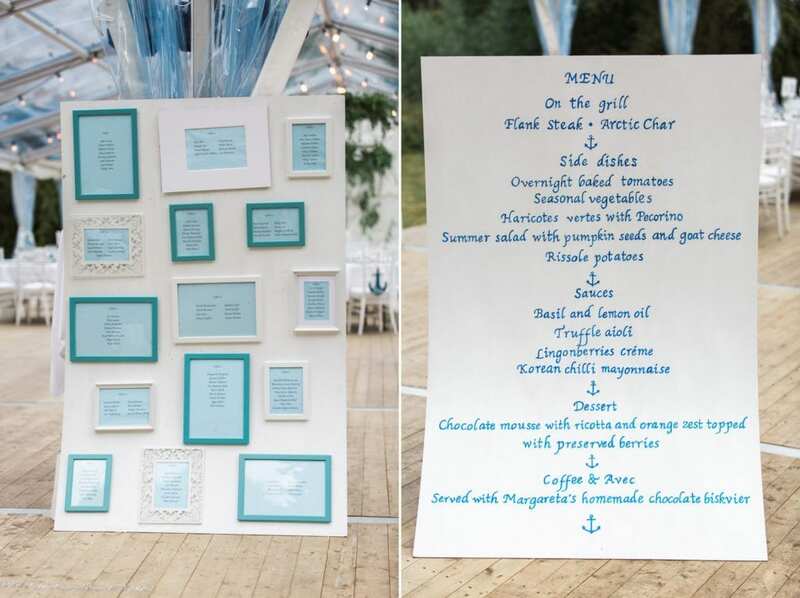 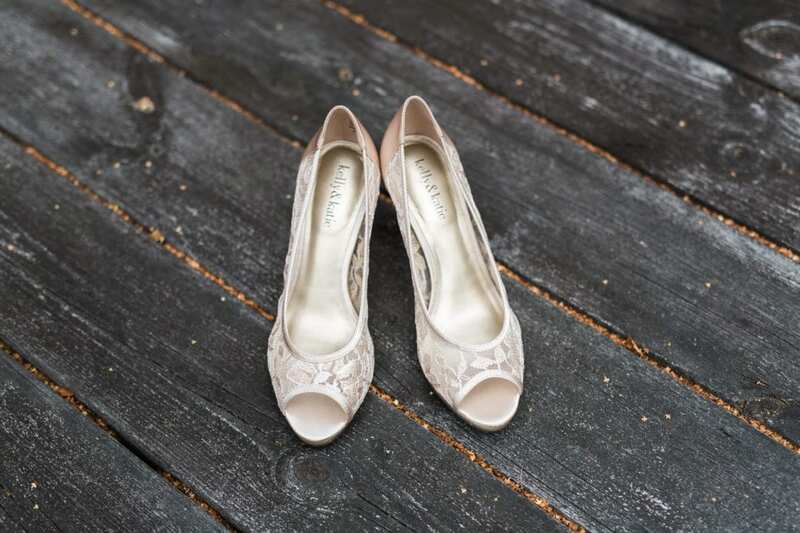 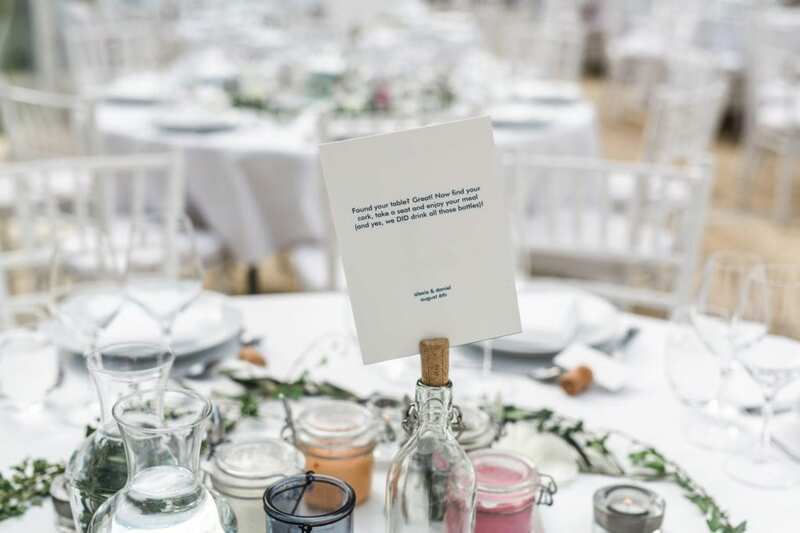 Our aim was to have a very relaxed and Scandi style wedding! 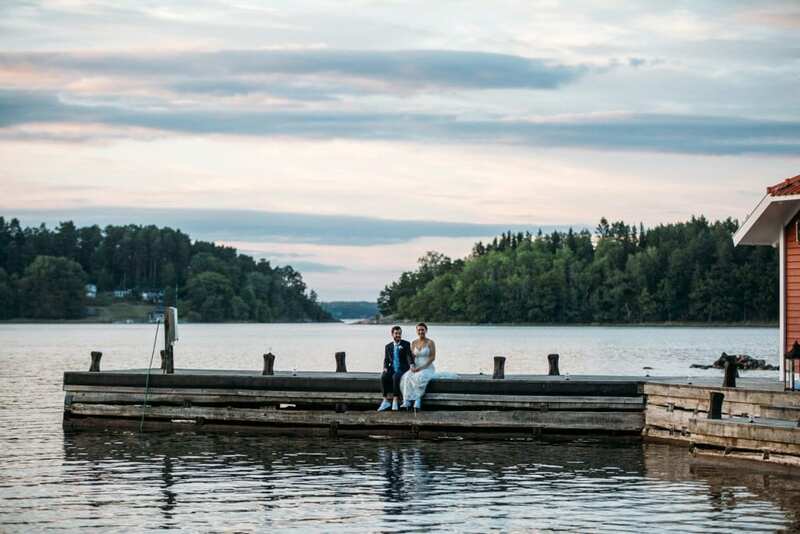 Publicering på Norwegian Wedding blog.